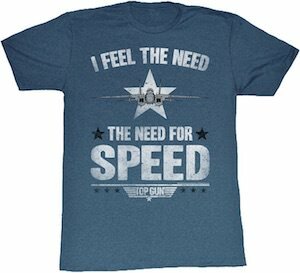 Now you can be wearing this I Feel The Need For Speed Top Gun T-Shirt. This men’s Top Gun t-shirt is available in sizes Small – 5XL and are made from 60% cotton and 40% polyester. On the t-shirt, you can see the Top Gun logo all the way on the button and in the middle there is a star with a fighter plane on top of it and then around all that there is the text “I feel the need, The need for speed”. And as this shirt is so cool it is just perfect for all the fans of the classic Top Gun movie but also anyone else that just wants a nice t-shirt.